Andrea asked yesterday whether I had tried the blocks on point. The answer is yes I tried that while my 2 friends were here Friday but I only had 4 light blocks made at that point. I did like them on point. Now that I have more blocks made I put the light ones in the center with the dark ones around the perimeter. There isn't as much difference between the dark and light blocks when they are on point (the straight version is on yesterday's post). I had 4 triangles in my batik scraps box that were left over from another log cabin quilt. I put them in as the setting triangles. I'm not sure if I want something that dark though. This would be the width of a quilt that I would make. It would be about 56" since the diagonal measurement of the blocks is about 14". The length as shown would be about 70". That is around the size that I want most of my quilts this year to be. I want to make more quilts instead of just a few really big quilts. I don't need any more big ones and I have so many ideas I want to explore. 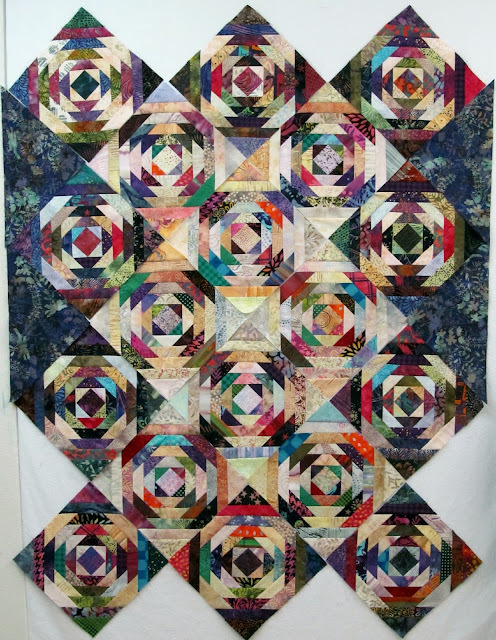 Having said that one of my UFOs is a big quilt but the blocks are already made and I need to just finish cutting the sashing and corner squares to finish it. Love this on point Wanda! Yes, I like them mixed and on point. So striking. Finally catching up on some blog reading. I am amazed what you have accomplished already this year. This has been a bad winter, good for staying in and sewing! I love the pineapple quilt, and I think I prefer the on-point layout. I'll have to see if that die i available for the "Go" cutter. I don't use my Accuquilt very much, I don't think of it too often. The newest die I have is the orange peel, and I haven't tried it yet. More snow coming here, good for staying in and sewing again! I like the on point layout, but am wondering why the lighter blocks no longer stand on their own, but seem to meld into the darker ones. I think any layout you choose will work well with these beautiful blocks. Looking forward to seeing how you finish this one and what arrangement you choose. I really like pineapple blocks - the last one I made was only 6 inch blocks and that was just too small and was taking forever, larger ones if I ever decide to do one again will be needed. I like the onpoint setting, and also the darker squares around the outside. 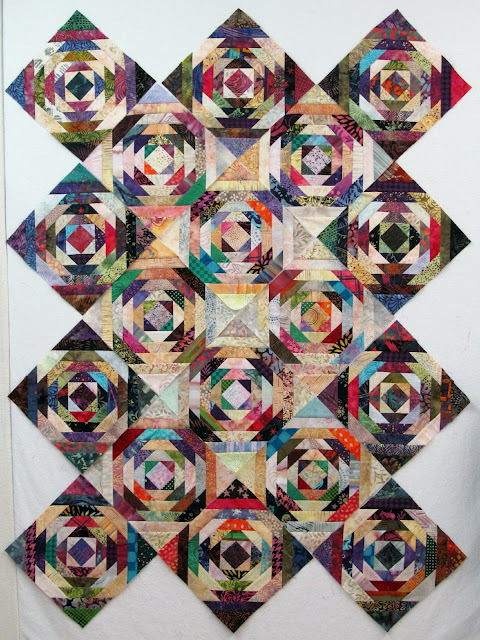 I think I'd like to see 1/2 squares (dark) in the triangular spaces, as that would finish off the dark border and also maintain the log cabinish look. 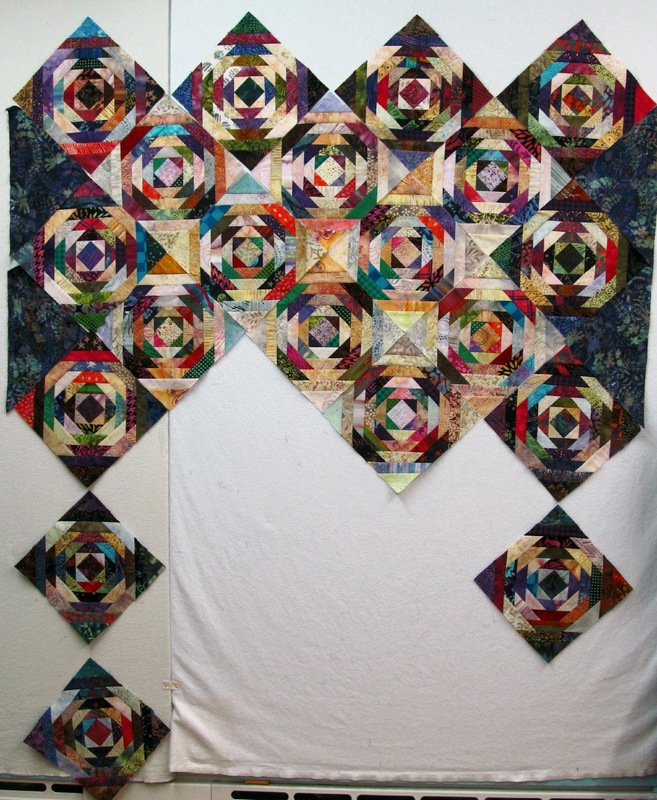 PS: I love your definition of "smaller" quilts: those dimensions pretty much mark my "big" category!!!!!! I agree with everyone else also, this block on point is beautiful. I really like your first photo it really sparkles, not sure about your dark triangle border. But you always see what we don't. I appreciate this statement, Wanda: "I want to make more quilts instead of just a few really big quilts. I don't need any more big ones and I have so many ideas I want to explore." . . . I am partial to on-point settings because they seem to have movement. I like the dark setting triangles, too, but if I were auditioning I'd see what lime green would do . . . Personally, I prefer the straight set layout. Stunning Wanda, I'm another who prefers the straight layout, love the look of the darks forming a border. Lovely pineapple blocks! I think I prefer the straight setting, as it shows off the diagonal-ness of the block better, which is what I love about a pineapple. Perhaps it is the dark setting blocks, but I like the straight setting better. They are such gorgeous blocks. The dark triangles might work if the lighter blocks are on the outside, but I agree they're not right as it's laid out there. I know you won't stop until it works! This si going to look great no matter how you set it!